Magnificently detailed and colorful statue of Illidan Stormrage. One of the most notable and popular characters in World of Warcraft. Stands an incredible 24-inches tall! Comes with 2 sets of interchangeable hands. You may not be prepared for the sheer awesomeness of this World of Warcraft Illidan 24-Inch Statue from Blizzard Entertainment. 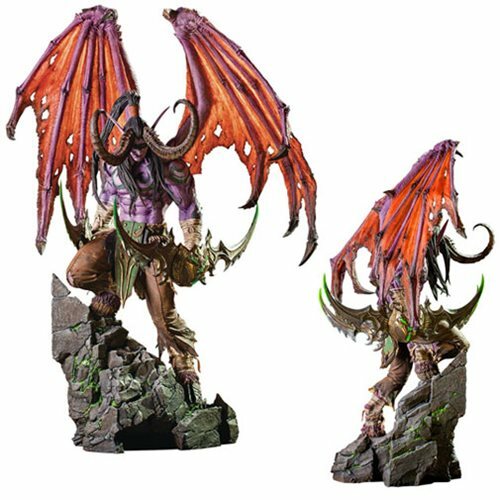 Standing an incredible 24-inches tall and made of polyresin, this magnificently detailed and colorful sculpture of World of Warcraft's popular Illidan Stormrage will make an impressive addition to your collection. And it comes with 2 sets of interchangeable hands (with and without Illidan's iconic warglaives)!